The First Great Treasure Day! What a month it's been! Many of the 10,000 Bibles that that have been provided by Bibles for Beach Club supporters are now in the hands of KiDs Beach Club® children all around America. 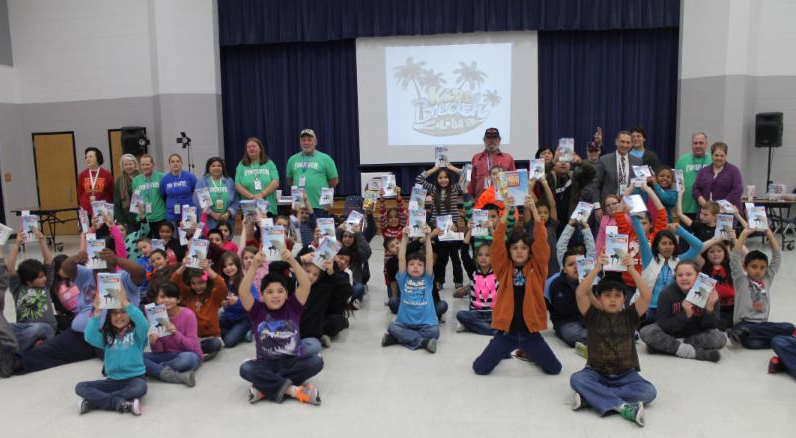 The very first KBC Explorer's Study Bible was handed out in Highlands Elementary outside Houston on February 3rd during the very first Great Treasure Day in the history of KiDs Beach Club®. God decided that the first of 10,000 children to get this Bible was a fourth-grader named, Jesus. "Now that was a God thing it really was a God thing," said Club Leader Kerrie Dobbs. "It's really special. Jesus is my name and I was the first to get this book about Jesus," said the first Great Treasure Day Bible recipient. "I just love Jesus. He chose me and I love Him." 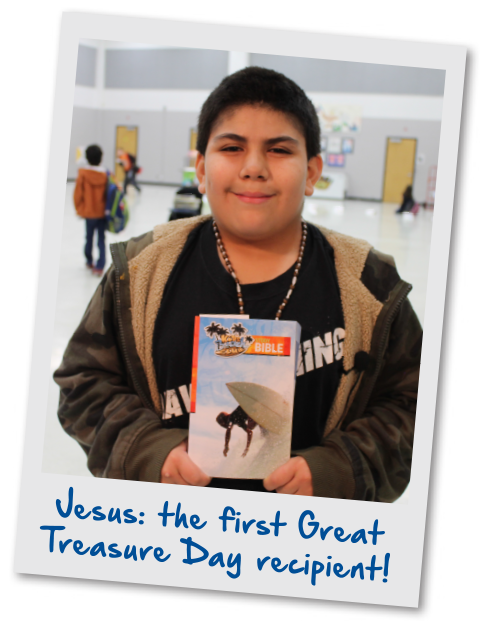 Jesus O. was the first of nearly 60 children to get a Bible that day and Ms. Dobbs believes the fact that every child in every club around the nation will get one will have an enormous impact. "I think it's going to be amazing. I think this is one of the ways that the Lord ordained to reach out to unchurched people who do not have Christ as their Savior and I think it's going to be the spark of the wildfire." Club volunteer Robin Edwards, who also serves as a teacher at Highlands Elementary, is excited to see how God's word will transform her school. "Our children have to be reading in the bus lines. Now we have many, many children armed and ready to share what they're reading," said Ms. Edwards. "At a public school, where children are able to share what they're reading from the Word of God, my goodness, think of the impact of them being able to share scripture now, all of them in our club, with their friends when they're sitting in that bus line or in class during independent reading time, they can read the Word of God!" As each child received their Bible from their Surf Team Leader, not one took it without a smile. All of these children knew that they had just received a great treasure after reciting the verse for the day from Psalm 119:162. "I rejoice at Your word as one who finds great treasure." "We're just very grateful for those who have made it possible to give every one of our kids in two Beach Clubs, their very own Bible," said Tim Edwards, Pastor at First Baptist Church of Highlands. "We're excited how it will not only be a tool to use at club but also at home with their parents." As the kids were being picked up at the end of club we smiled as we saw each one holding up their new treasure to show their parents. What a sight! Later that evening one parent shared a picture with us of how her son spent the evening exploring his new KiDs Beach Club® Explorer's Study Bible. 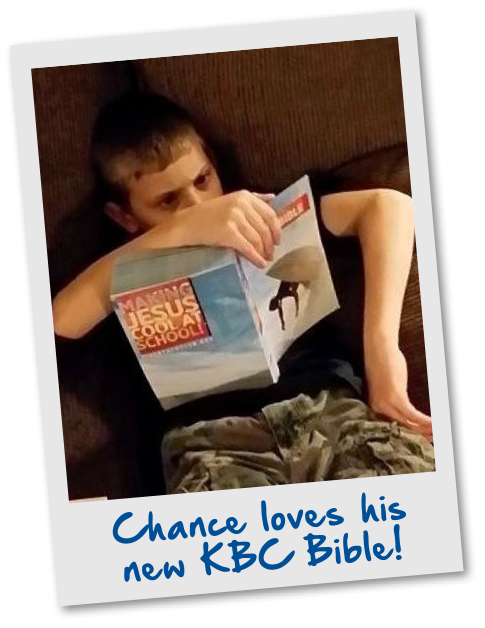 "Chance loves his new KBC Bible!" is how she captioned the photo.